Steaming the face to open up the pores is a great way to improve the effectiveness of your blackhead removal products. Opening up the pores allows for products such as pore strips and clay masks to penetrate inside the pores to deeply remove clogged up toxins and oils. Therefore, if you are tired of blackhead removal products which do not work, then steam is probably the solution to your problems. To generate steam, some people choose to boil a kettle of water, pour the hot water into a container and place their face over the container for 5 minutes. The issue with this, however, is that the steam is not refined, resulting in reduced absorbance by the skin. Also, this can be a time consuming and tedious method of steam production. Luckily, however, a product exists which can make it all much more simple and efficient. Home facial steamers have become a must-have item for people who regularly have to deal with blackheads so we thought it would be useful to make a best facial steamer for blackheads review. With respect to value for money, we believe the Secura Nano Ionic NanoCare is one of the top facial steamers on the market today. This facial steamer generates superfine hot steam within seconds of being activated. This nanoscale steam is designed to be easily absorbed by the skin’s pores to provide faster moisturization and pore expansion. The smooth and sleek design of this home facial steamer renders it not only a useful home beauty product but also an ornamental display item within your personal home beauty parlor. Regarding design, the Secura Nano Ionic NanoCare Facial Steamer is at the forefront of the facial steamer range. We have found that knock-off or cheap facial steamers are about as useful as boiling a pot of water and placing it over the face. This facial steamer, however, can provide for quality results at home. Think of the money you could save on facials by home steaming once a week and applying a vitamin C serum yourself. We consider the Secura Nano Ionic NanoCare Facial Steamer to be the best value for money facial steamer out there. This steamer is also suitable for those who are new to facial steamers and want to give it a try. Outside of professional salon quality, the Panasonic EH-SA32-P Pink Facial Steamer is one the most advanced home facial steamers on the market today and when it was released, it was described by some as a revolution in home-facial care. Akin to Secura’s model, this steamer creates a nanoscale mist of steam. All you need to do is fill it with water, and it will generate steam/humidify your room for around 10 minutes. Why go for this model? 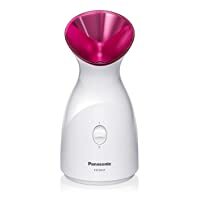 Unlike some other brands of facial steamer, the Panasonic EH-SA32-P Pink Facial Steamer benefits from a coated ultrasonicator which evaporates water instantly for immediate results, certainly beats waiting around for the kettle to boil! This facial steamer has a very solid simplified design which is designed to last. If you are looking for a long-term facial steamer, this could be the model for you. Some other models of facial steamer produce an odd odor while heating up the water due to a reaction with the chemical element. The coated ultrasonicator eliminates this problem, and by using distilling water, you should find your experience to be odorless and relaxing. We believe the Panasonic EH-SA32-P Pink Facial Steamer is one of the best mid-range home facial steamers around and has gained a reputation for high quality. The Panasonic EH-SA31VP nano Facial Steamer is a high-end facial steamer which hit the market in around 2014. This facial steamer separates itself from the competition with what we consider to be salon quality technology that provides some of the best results around, for a very reasonable price. According to Panasonic, when you press the push button, you will be immersed in a mist of vapor 4000 times more refined than ordinary steam. This treatment can moisturize, cleanse your skin, and may even be powerful enough to loosen make-up before removal to prevent damage to the skin. The refined mist of this facial steamer may even give it the power to help reduce the effects of aging. As we get older and the skin loses its elasticity, it is important to keep the face moisturized for the prevention of lines and wrinkles. By steaming the face before using a moisturizer or anti-aging cream, you will open up your pores to receive more nourishment. Other facial steamers are not as adept at opening up the finer pores where wrinkle lines are more likely to develop. Unlike other facial steamers, this steamer provides you with a range in functionality, offering different steam settings so that you can personalize your skin care routine. If you use a multitude of facial skin care products and are looking to get the most out of them, then this professional facial steamer may be for you. Its stylish design and high-quality functionality makes it an irresistibly luxurious addition to your home beauty regime. This facial cleanser can also make for a great single room humidifier and even when not in use; it serves a purpose as a beautiful ornament. The Panasonic EH-SA31VP nano Facial Steamer is our pick as the best facial steamer on the market today.